It might be the end of summer where I’m writing this from, but legendary slot developer Microgaming’s festive slot based on the classic Charles Dickens novel, A Christmas Carol, has put me right in the mood for some turkey curry, crap TV and dodgy sweaters from my Aunt. 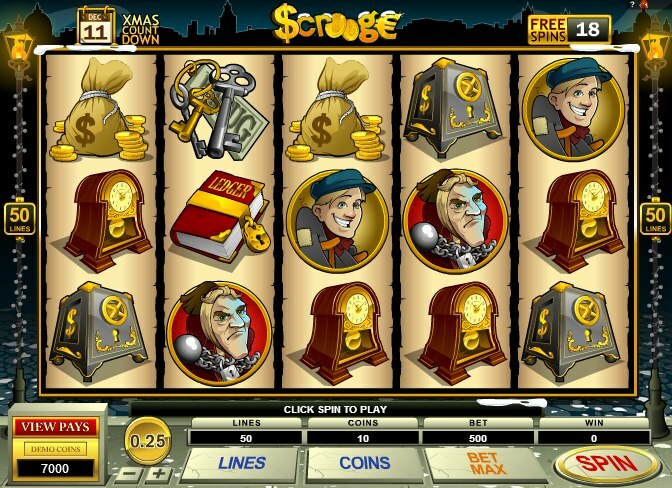 A very un-Scroogelike 50 pay-lines is on offer in this 5 reel video slot, and with a maximum jackpot of $30,000 up for grabs, you could well be dancing in the streets on Xmas morning too. Everyone you know and love from the story adorns the reels, including Scrooge himself, his put-upon employee, Tiny Tim, Jacob Marley, and the three ghosts of Christmas, plus other Scroogey icons like bags of cash, ledgers, keys and safes. Just to remind you that you’re in a Christmas-themed slot, bells and jolly music plays in the background to put you in the festive mood. The Silver Coin is the game’s Wild and substitutes for all symbols other than the Scatters. Here’s where the game’s neat touch comes into play: after each winning combo has hit, you’ll either win a free spin or a date on Scrooge’s calendar. Once you get to December 25 on the old codger’s calendar your free spins round will start. All the spins receive a 2x multiplier to boot. The Door Knocker symbol triggers a second bonus game when three or more hit the reels. Essentially a classic Pick Me Bonus feature, you choose a Christmas meal for each of the story’s main characters to gobble up. Each meal reveals a different bonus award, and with some careful Chrimbo planning, a 10,000-coin jackpot can be yours. Christmas is a time for giving, and slots developers seem to give out more than most. 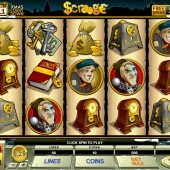 Scrooge is the latest in a long line of generous online festive slots. And if this game has put you in the mood for more Yuletide yomps, try out Playtech’s own take on the Christmas Carol theme, Ghosts of Christmas, with its generous free spins bonus round, or Microgaming's very own Deck The Halls slot.